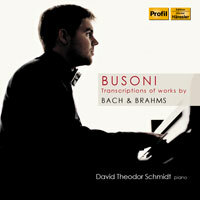 New CD: "Busoni - Transcriptions of works by Bach & Brahms"
Recently, David Theodor Schmidt's new CD "Busoni - Transcriptions of works by Bach & Brahms" has been released in many countries. On this record, Schmidt once more enters the field of transcriptions, works that were originally composed for another instrument. Ferruccio Busoni's masterful arrangements are regarded as some of the highlights of this very special form and have been part of David Theodor Schmidt's concert programmes for years. His new CD contains famous works, such as Busoni's transcription of Bach's Chaconne for violin solo, but also lesser known pieces like the Brahms transcriptions. The CD was recorded in December 2013 at Schloss Britz in Berlin-Neukölln. In February 2013, David Theodor Schmidt's CD "'Der Dichter spricht' - Poetry-inspired piano music" with works by Liszt, Brahms and Schumann was released in Germany and many other countries. For availablity in your country check with your local dealer or on the Internet. One of the works, Liszt's Sonetto 104 del Petrarca, was also recorded on video; Have a look! Following numerous positive reviews in Germany, David Theodor Schmidt's CD "Bach - Original works and transcriptions by Liszt" has also received an enthusiastic review in Fanfare Magazine. Reviewer Raymond Tuttle concluded his review, saying "This is playing that will go on satisfying the listener long after the thrills that other pianists purvey have faded."